RIT/NTID students were honored with their families and friends at an academic awards ceremony May 11. NTID President Gerry Buckley, front row left, and Gary Behm, interim associate vice president for NTID Academic Affairs, front row right, hosted the event. 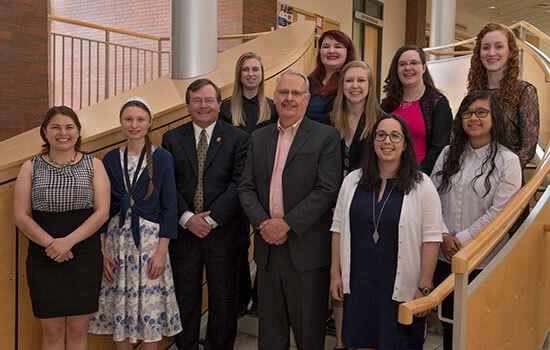 Several students at Rochester Institute of Technology’s National Technical Institute for the Deaf were honored with their families and friends at an academic awards ceremony May 11. NTID President and RIT Vice President and Dean Gerry Buckley and Gary Behm, interim associate vice president for NTID Academic Affairs, hosted the ceremony. Jimmy Wong, an applied computer technology major from Chicago, received the Academic Achievement Award for students earning an associate degree. Radhika Mehra, a fine arts major from Rochester, N.Y., received the Academic Achievement Award for students earning a bachelor’s degree. Kailey Martin, a visual arts-all grades major from Londonderry, N.H., received the Academic Achievement award for students earning a master’s degree. Sabrina Serna, a laboratory science technology major from Lake View Terrace, Calif., received the Outstanding Graduate Award for students earning an associate degree. Emmanuel Perrodin-Njoku, biomedical sciences major from Washington, D.C., and Megan Freeman, a management and information systems major from Missoula, Mont., received Outstanding Graduate Awards for students earning bachelor’s degrees. Eva-Alaine Thibault, an ASL-English interpreting major from Rochester, N.Y., received the Outstanding Graduate Award for interpreting students earning a bachelor’s degree. Paula MacDonald, a computer-aided drafting technology major from Cumberland, Ontario, Canada, was the 2018 NTID college delegate for undergraduate students.